Are you looking at new SUVs for a specific budget? 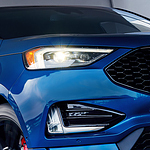 The Ford Edge ST is one of the most powerful SUVs on the road. It comes with a twin-turbocharged V6 engine that can put out 335 horsepower and 380 pound-feet of torque. However, it’s also about the handling and suspension. With the all-wheel drive features, it’s easy to take this SUV anywhere you want to go. Most SUVs in the midsize class are built for comfort, but the Edge ST is built for both. That’s why it received such high ratings from drivers and critics for reliability, safety, interior, and performance. You’ll get everything from the Edge ST, including a spacious cabin and lots of cargo space. Have you been looking for your next SUV? Why not check out the Ford Edge ST when you test drive at Crump Reese Moab Ford. Schedule an appointment online today.